There are endless creative wedding themes & formats to choose from when planning your wedding. Looking to go beyond tradition? Does a dinner & dancing reception sound a little, meh – been there, done that? Join me today for a detailed walk through some creative wedding themes & formatting ideas. We all know and love the afternoon ceremony followed by evening dinner & dancing reception. But, maybe you’re looking to do something a bit more creative, “outside the box”. 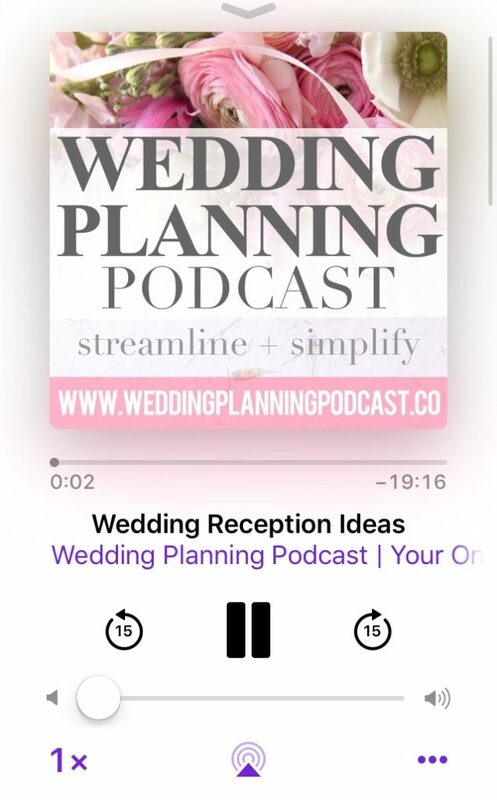 Today’s episode is perfect for you if you’re newly engaged and still working out the details of your wedding day vision, including your wedding venue, wedding theme & wedding day timeline. Go for it if you’re looking for affordability + the opportunity to set up a killer DIY mimosa bar. Keep in mind that you’re going to have a severe time crunch the morning of getting ready, which is the major downfall to this format. Pro’s & con’s are much the same as the Brunch Wedding – see above. I LOVE the idea of doing a cocktail reception, then moving into a small, intimate dinner with only your closest family & friends! A long weekend gives guests more time for travel. This is primo for hosting a multi-day event, like a big welcome party, wedding day, followed up by a brunch on the day after. The not-so-good? Expense + availability crunches happen over long holiday weekends. Plan well in advance. OK, this one is quick + easy + gives time to save for a larger wedding celebration down the road. The downside is missing out on the tradition + fanfare, but for some of you, that’s exactly the point. Round this out with an intimate celebration afterwards, like a wedding day brunch or evening dinner with your closest friends & family. If John and I renew vows and pretend to get married all over again, look for us in the islands! A destination wedding is easy to plan. You’re banking on a built-in vacation with your closest friends & family. My favorite creative wedding idea by far! The great news is that there are literally endless creative wedding themes to explore, and I always encourage you & your fiance to use your imaginations and build a wedding day that feels perfect to YOU. Questions about today’s show on Creative Wedding Themes, or your own wedding plans? Please feel free to be in touch! Claim your $50 registry credit when you sign up for a FREE wedding website & registry with ZOLA! Listener contests, special promotions & more!